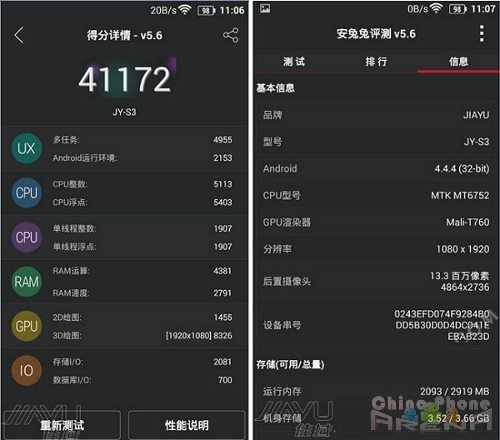 Jiayu has released screenshots showing the Antutu scores from the Jiayu S3 flagship model. The S3 is another MT6752 phone that has hit the market. The entry-level version of the phone carries 2GB of RAM which should be sufficient for the average phone user. Of course, 3GB of RAM is very attractive as it will give larger room for multi-tasking and faster response. The S3 features a 5.5 inch screen with a 1080p resolution display, and a layer of Corning Gorilla Glass. The phone supports 4G LTE networks, specifically Bands 3/7/20 for FDD-LTE and Bands 39/40/41 for TDD-LTE. It also has tri-band 3G with network support for 900/1900/2100MHz. The primary camera is equipped with a Sony IMX214 sensor with 13MP resolution, while the front-facing camera is specced at 5MP max. Similar to the Zopo ZP920, the S3 is claimed to have Glonass GPS support. The phone will be powered by a 3000mAH battery, and will be running Android 4.4 out of the box. The Antutu score released was from the 3GB version of the S3. The screenshot showed a total of 41172 with incredible figures in the RAM criterion as well as the 3D graphics. The 3GB version may be the lowest priced phone out there with such a feature-packed spec set (RAM storage in particular). It is currently priced around the $170 range.